As a symbol of freedom and adventure, motorcycles are exhilarating but they can also be dangerous. The Centers for Disease Control and Prevention’s website shows that there has been a 55 percent increase in motorcycle accident deaths since 2000. Despite the risks associated with riding a motorcycle, motorcyclists can increase their safety with the latest technology in protective gear. A helmet is the most important item to protect a motorcyclist. A motorcyclist should only purchase and wear a DOT-approved helmet — a helmet that has undergone extensive testing. These DOT tests have been mandated by the National Highway Traffic Safety Administration since the 1970s. To the dismay of many motorcycle safety advocates, the helmet market includes countless novelty helmets that put style before safety. In a few instances, a novelty helmet has been the primary reason for the death of a motorcyclist, and the death could’ve been prevented if the rider had invested in a safer helmet. The CDC’s statistics reveal that helmets can definitely save lives. In the example, the CDC’s website reports that helmets have helped prevent an estimate of 37 percent of crash deaths among motorcyclists and 41 percent of crash deaths for motorcycle passengers. After twilight and during extreme weather conditions, it can be difficult to see a motorcyclist on the road. When a rider chooses to wear visibility gear, though, he or she increases his or her chance of being seen by others on the road. As well as equipping a DOT-approved helmet, a motorcyclist should wear reflective, bright clothing with good coverage and gloves with a secure grip. A motorcyclist could also choose boots with reinforcement and plastic caps on the ankle and toe areas. A large amount of debris could fly up and hit a motorcyclist on a routine ride, so it’s best for a motorcyclist to wear thick, weatherproof clothing with extra support in the elbow, spine and shoulder regions. It is even smart for a motorcyclist to wear protective eye wear. Many helmets provide eye protection, but if not, a motorcyclist can invest in a pair of safety eye wear. The eye wear should enhance vision while also protecting from sun, wind, rain, debris and insects. Competent Eye wear also provides UV ray protection, has a scratch resistant lens, and fog resistant coatings, according to CaliforniaBiker.org. There are many ways a motorcyclist can equip him or herself for ultimate motorcycle safety. A DOT-approved helmet could be the difference between life and death for a rider. Also, sturdy high visibility gear allows riders to be seen well on the road, especially at night and during rough weather. The eyes should be thoroughly protected with the appropriate eye wear. Past recent days we have been so busy that there was no time to make a great post. However, Biker News Online has picked Road Pickle as their topic, and in that article our leather jackets are featured. Before leaving on our Road Pickle Motorcycle Bohemia, we knew we would need durable leather jackets that would stand up to all road conditions. We wanted lined jackets with air vents so we could make the adjustments needed for all types of weather. Reaching out to EBiker Leather, we found just what we needed at great, affordable prices. Retailing at less than $80, my Ladies Jacket is soft and supple, just what a biker chick wants, but still thick and durable. The high quality leather fits my shape perfectly while protecting me from the elements. With over 6,500 miles on this leather jacket, it still looks amazing. The jacket is fully lined with a warm, zip-out lining, protecting me from temps down to 40 degrees while riding. Also equipped with air vents, I find myself comfortable in the 90+ degree weather as well. If I keep moving the air circulates nicely and protects me from the sun. My husband also got his Ebiker Leather jacket, retailing at around $110, which he’s been utilizing on this trip. Heavy leather with reinforced shoulders and elbows make for this very durable Men’s Jacket. Also equipped with a full, zip-out liner and air vents, this jacket works in all temperatures. With a number of zippered pockets, most of them hidden inside, the jacket holds everything a rider would need, completely safe inside. Stylish and sturdy, this jacket is meant for riders who look to spend a good amount of time doing what they love best; riding! We found both to be great fitting, versatile, weather resistant, tough and stylish, as well as incredibly affordable. Most riders we meet are as shocked with the great prices as we were. Withstanding rain and hail as well as high temps and sun, these jackets look as good as new and wear better each ride. Motorcycle protective gear dates back to 1935. This early interest developed after the death of T.E Lawrence who crashed while riding his motorbike. This demise could have been prevented if he had some protective gear on him at the time of the crash. This is the reason why today there is so much emphasis on putting on the correct protective gear before riding your motorcycle. The most common material used for the protective gear is leather. This is because of the strength of its fabric to absorb friction. This makes it ideal to protect you in case of an accident. Your body will be safely protected beneath the leather. This reduces instances of burns and bruises. The protective gear comes in the form of a trouser and a jacket. They come in many designs and style. You should be able to pick one that will best suite your needs. The style considered while choosing a leather protective gear should put into consideration the following. First and foremost, the body parts to be protected. These include the elbows, knees, chest and back. The leather jackets should be padded on the elbow. This is just the extra clothing that is added on the inside of the elbow part of the jacket. It serves to protect your hands in case you fall off the motorbike. The knee receives the same kind of protection. The style of leather jacket chosen should also be heavy around the chest area. While riding a motorcycle you are going against a fast moving wind current. This wind is able to penetrate through your clothes and into your body. Without the correct protective gear you will be exposed to chest problems. Therefore it is important that the kind of jacket that you chose to be made heavier at the chest area. This will keep you warm and safe from the wind. Apart from the safety part of the protective aspect of this gear, it is important that you get a style that is in line with your daily activities. For instance if you use your motorcycle to go to work, consider a black leather gear. This will blend easily with your official wear. You can even retain the leather jacket during the cold season and it will complement your official wear. If your bike is just for leisure activities you are free to explore the style and designs that are available in the market. Above all the leather protective gear should be comfortable. Leather is a heavy material. Therefore it can be cumbersome if it is not tailored correctly. While buying the gear put in on and make sure it is a perfect fit. A loose gear will not only come with additional weight but also resistance to the wind. Remember that when you are on the motorcycle you should be as streamlined as possible. This allows you to glide smoothly while on the road. A good motorcycle leather protective gear should blend safety and style together. The contact for dsa comes in handy while you want to inquire more about your safety while on the road on a motorcycle. It is a pretty exciting day for everyone at eBikerLeather.com . We have just received 4 new patches that will be added to our collection with in no time. They are not just your ordinary patches, these are the patches that public craved for and we have them for you at only 5.99$ per patch. What are the numbers on the picture? The numbers represent the image of the picture. Meaning the background and border is the same on the patch but the image inside is different. However, we have another additional biker patch in our selection, “Bikers United Respect All Who Ride”. This is the biker patch that everyone was waiting for, and we have 250 of that patch for a start. I had about 100 requests to get that patch. Ok, now you can stop reading this bring post and click here and here to shop our new biker patches. Jesse James might have lost a fingertip but has gained valuable partner for his upcoming custom rides. Renegade Engine Company is one of the most trustful companies out in the world that provide motorcycle engines. The two parties begun work immediately and agreed to bring more power to West Coast Choppers motorcycles. 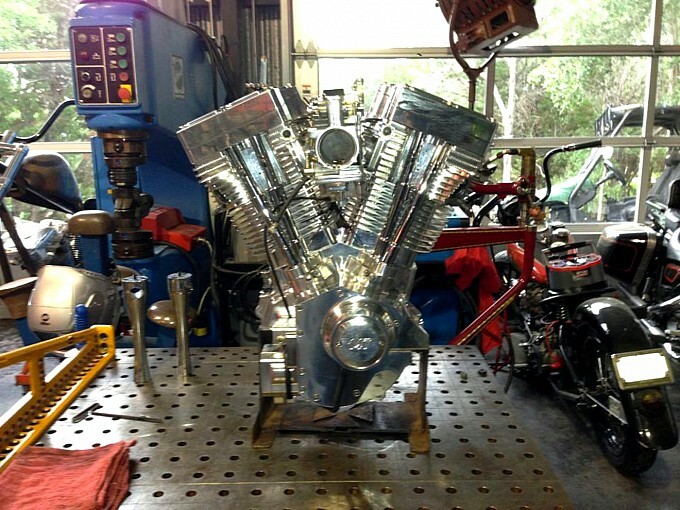 As the progress goes on Jesse received 147ci Diamond cut V-Twin unit for his new CFL (Choppers for Life) frame. Looking ahead into the future, Jesse James will have his own branded Jesse James engines. As we know Jesse James has the power, tools, design, edge cut, and much more to create a really awesome motorcycle out of anything that comes to his mind.